USB Tower Fan Compatiable With Laptop And Power Bank Also With 2 Speed Controls. We ensure to provide clients with the best range of Air Circulating Fan. These Air Circulating Fans have non corrosive housing and based on advanced working principle. The Air Circulating Fan that we offer ensures efficient performance for longer time. available in 9" and 12"
We are dealing with ISI Fresh Air Fan. - 300mm and 225mm sweap. - Capacitor Start & Run Motor. - Noiseless Operation suitable for Kitchen, Toliet, Small Counters etc. - Double Ball Bearing for long life. 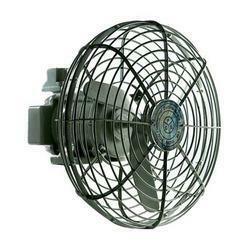 These offered Air Circulating Fan are best in quality and offered in the market in different sizes and shapes. These fans are best in finishing and completely safe from the damage by fluctuating power input. Besides this, quality checked parts are used for the manufacturing of these circulating fans. Air Circulation System-Shaft, Fan Impeller to suit various furnaces and processes. SS pots, fan assemblies, heating elements, SS fans and furnace lining anchors. A railway electrification system supplies electric power to railway trains and trams without an on-board prime mover or local fuel supply. Electrification has many advantages but requires significant capital expenditure. JM AEROFOIL fans are designed considering AMCA guidelines for its aerodynamic performances.With its adjustable pitch of blades these fans can be offered just matching the customer requirements in flow and pressure.As a standard practice are offered in hot dip galvanised or cold zinc spray finish to increase life of casing. Ankit Air Systems Pvt. Ltd.